Next month you are likely to hear more than the average chatter about the benefits of a vegetarian diet. But for more than a million older adults seeking a healthy lifestyle, Vegetarian Awareness Month is year-round. About 40 years ago Anne and Ed Wardwell decided to try a vegetarian diet, inspired by the bestseller Diet for a Small Planet and upset over the ethical treatment of farm animals. The couple was hooked, so nine years ago when they moved to Kendal at Oberlin having a daily vegetarian meal was a deal-breaker. “We were told it would not be a problem and it hasn’t been. We have a vegetarian entrée every night,” Anne says. Anne is one of approximately 7.3 million Americans (1.2 million who are over 55) who follow a vegetarian-based diet, according to a study published by Vegetarian Times. More than half of vegetarians say they follow such a diet to improve their overall health, followed by environmental concerns. A smaller group of people, about 1 million, are vegan, meaning they only eat foods from plants – fruits, vegetables, legumes, grains, seeds and nuts. Carla VanDale’s journey to embracing a vegan diet took years. A long-time nurse and former psychotherapist, Carla VanDale and her husband, Bob, lived near Westminster College in Pennsylvania, where Bob was a professor. Her lifestyle changes, which she continued to practice after moving to Kendal, proved effective for years. Her cholesterol lowered, and she felt energized. Then, about three and a half years ago, Carla’s doctor noticed an increase in her LDL (or “bad”) cholesterol. “My physician tried a number of things to bring my LDL cholesterol back to a normal level, but nothing seemed to work,” she says. Carla and her husband traveled to the Cleveland Clinic to learn more about veganism from Caldwell Esselstyn, Jr., M.D., a renowned researcher, surgeon, and vegan lifestyle advocate. Dr. Esselstyn has helped many individuals venturing into animal-free eating over the years, including former president Bill Clinton. Carla and Bob attended an all-day workshop where Dr. Esselstyn presented medical research touting the effectiveness of a low-fat vegan diet. His wife Ann, also a vegan, discussed the nuts and bolts of plant-based eating, including what products to buy, where to buy food, how to prepare food and more. “After that day, we committed to going the vegan direction and have done it ever since,” Carla says. The couple has gotten lots of support from Kendal. “The culinary staff has worked really hard to meet our needs,” she says. Hiring vegan cook Wayne Jacob has also been a great asset, she adds. In fact, Wayne made such a delicious corn and shallot chowder when the Esselstyns came to Kendal for dinner that his vegan recipe was included in Ann and Jane Esselstyns’ The Prevent and Reverse Heart Disease Cookbook. 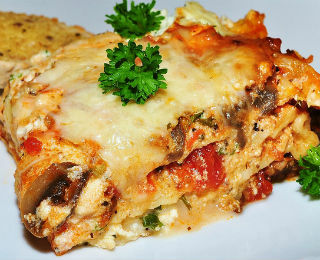 A popular Kendal recipe for vegetarian residents who consume dairy products is Vegetable Lasagna. For a vegan version, be sure to use egg-free pasta, omit the cheese layer and add an extra layer of veggies. Combine vegetables and sauce. Simmer for 15 minutes. Layer lasagna in 9X13 pan in following order from bottom to top. Cover with food film and foil. LET REST FOR 20 MIN. BEFORE CUTTING. Use all the sauce. It will seem like a lot, but will be absorbed with the UNCOOKED pasta, resulting in a firmer product. There will be pasta leftover. Using the film/foil will result in moister product and film will not stick. LET REST FOR 20 MIN. BEFORE CUTTING. IF YOU DON'T THE PRODUCT WILL 'RUN' AND FALL APART. IT WILL STAY HOT.